Nottinghamshire's former England seamer Harry Gurney has retired from County Championship cricket and will focus solely on limited-overs matches. The 32-year-old left-armer has agreed a new deal at Trent Bridge until 2020 for the T20 Blast and One-Day Cup. Gurney is set to play for the Kolkata Knight Riders in the Indian Premier League and won Australia's Big Bash this year with Melbourne Renegades. He was in the Notts side that did the T20 and One-Day Cup double in 2017. "While it's a disappointment that Harry won't be playing red-ball cricket for us anymore, we're really pleased to have him committed to us for one-day cricket over the next two seasons," director of cricket Mick Newell told the club website. "He's one of the best white-ball bowlers around. Once he made his decision, if we didn't offer him a white-ball deal there would be 17 other counties wanting him to bowl for them. 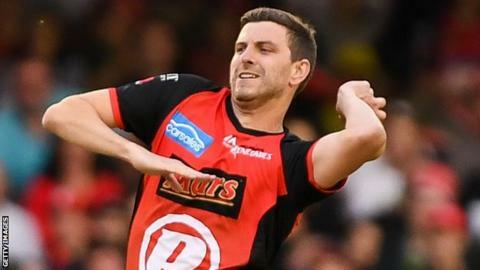 Gurney, who began his county career with Leicestershire, played 10 one-day internationals and two T20 matches for England in 2014, taking 14 wickets.